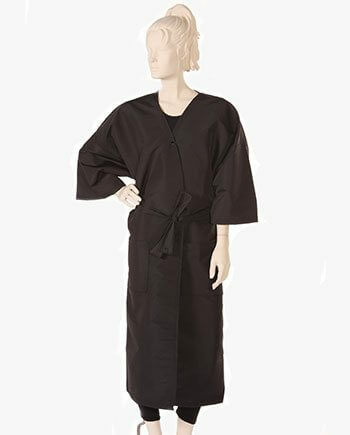 Welcome to the best top quality all-black waterproof top and Silkara Iridescent fabric bottom salon cape and or barber cape on the market! As with all of our garments, this all black waterproof Polyurethane top and Silkara Iridescent fabric bottom is made from the best waterproof Polyurethane & advanced long lasting Silkara Iridescent fabric that is chemical and stain resistant. 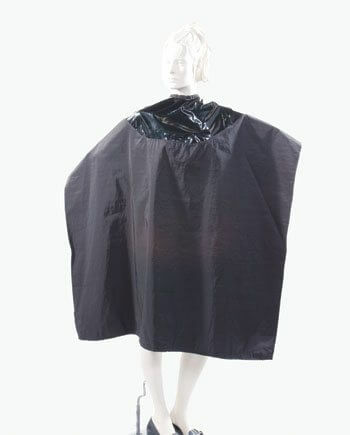 This Waterproof top black hairdresser salon cape is color proof and a great value that will last for years. This fantastic cape can be used for, all wet treatments. Plus great for a cutting cape, coloring cape, bleaching cape, comb-out cape and shampooing cape. 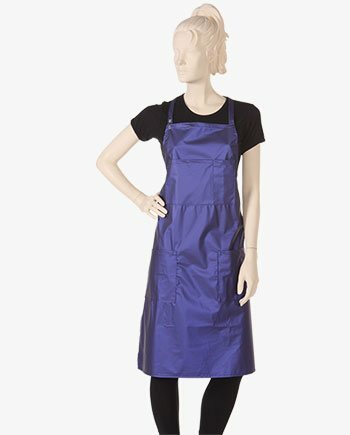 Hair will not stick to the Polyurethane top or the 55% Polyester and 45% Nylon fabric bottom on this excellent stylist cape and it will keep your clients cool, comfortable, and dry. Our styling cape neck size is 12”-24” inches and is adjustable from kids to X-large necks. Our salon cape average size is 50” wide by 60” in length. Only the best barber capes use our Signature durable stainless steel snaps. 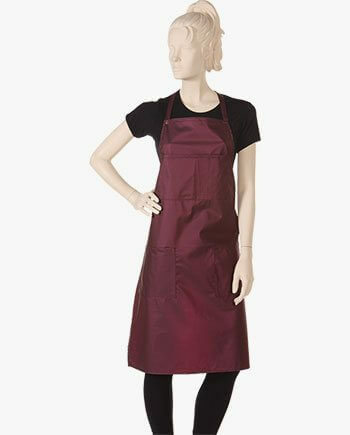 Like all of Salonwear’s garments our hair styling capes, gowns, robes, and aprons are made in the USA. Visit our Branding page to learn more about how to personalize your hair stylist cape or garments with your salon logo, name, or message. Nice cape! Protects the clothing from water and color. Not too thick so individuals do not get too hot, but thick enough to be protective. It has an Additional coating round the neck for Extra protection. The snaps are convenient and I love that I do not need to fret about hair color or water getting around the neck but it’s still fairly adjustable. Love love and worth every single cent! This cape is made with great quality and the water did not go through getting my client wet. I really like the two tone cape with the black waterproof on the top.